Charlotte 49ers All-American women’s soccer senior midfielder Hailey Beam has been named to the Missouri Athletic Club’s Hermann Trophy watch list. The Hermann Trophy is awarded to the top player in collegiate soccer. Last season, Beam played an integral role in helping the 49ers win their third straight Atlantic-10 regular-season title and their second straight A-10 tournament title to go along with the program’s fourth-ever NCAA Tournament appearance. Charlotte lost in the second round of the NCAA Tournament and finished with a school-record 18 wins. 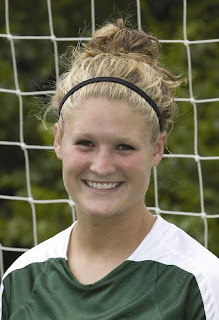 Beam became the program’s first consensus All-American after being named to Soccer Buzz, Soccer America, NCSAA and TopDrawerSoccer.com’s All-American teams. Beam was named A-10 Midfielder of the Year as well as the A-10 championship's Most Outstanding Player for the second straight season.